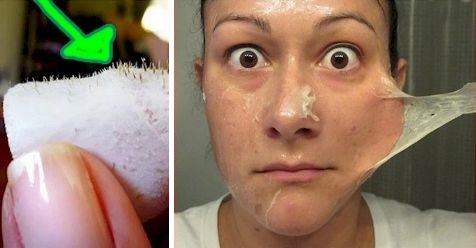 The biggest problem means blackheads and in this post I will tell you how this lady solved her blackheads problem very easily just used 2 ingredients. 1. Take a clean bowl and add 1 tbsp of gelatin and 2 tbsp of milk in it, and mix them well. 2. Heat this mixture in microwave for 10 seconds. 3. Now immediately apply this mixture on your face. 4. Leave this paste at least 15 minutes. 5. At last, peel it off. Your blackheads will be removed.